With hundreds of lemons on our faithful tree, there’s been a lot of pancake breakfasts going on here of late. I know you can do all sorts of wonderful things with pancakes/crepes/hotcakes – topping with fresh or poached fruit, yoghurt, lemon curd, bacon and maple syrup. 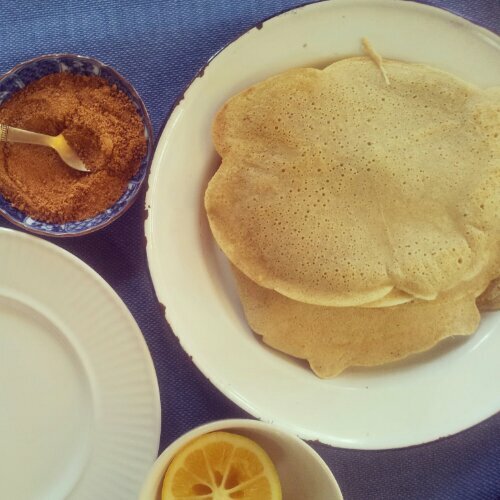 All delicious, I’m sure, but in our house we rarely sway from the classic pancake accompaniment: lemon and sugar. I’ve been making pancakes with different flours lately. Made with spelt, they’re very similar to a regular white-flour pancake, but this version, made with buckwheat flour, is gluten free and less stretchy in texture – a little more cakey and therefore probably very good for topping with things, but still perfectly fine for rolling up into a thick cigar oozing a sweet lemony confection. 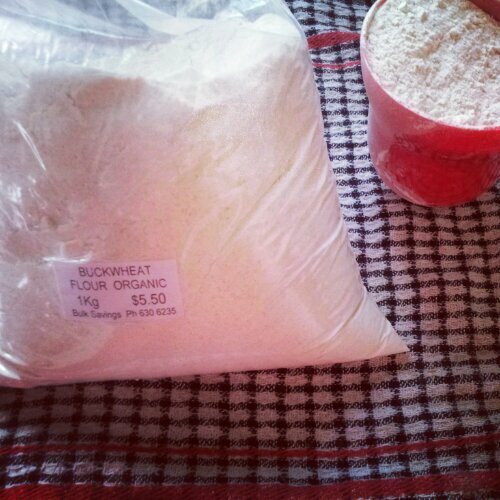 Buckwheat isn’t a cereal grain at all but the seed of a fruit; entirely free of gluten, rich in nutrients especially flavonoids and single-handedly capable of fighting diabetes with its glucose-lowering prowess. I find it has quite a distinct flavor of its own which hard to describe – little grassy and a little nutty, perhaps. I’ve used a bit of spice and honey to sweeten these pancakes, but you know what would also be delicious? A savoury version, minus the spice and sweet, with maybe a bit of parmesan grated into the batter. Then fill it with creamy mushrooms, maybe, or ratatouille, for a nourishing meal. Bear in mind this recipe will yield pancakes that are thin and flexible enough to roll up, but if you’d like to make thicker, American-style ‘hotcakes’, just cut the amount of milk to get a thicker batter, and don’t spread the batter out so thin in the pan. 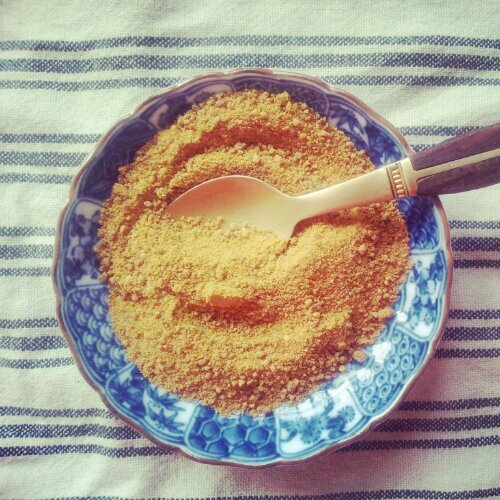 Into a large bowl sift 1 cup buckwheat flour, 1 tsp cinnamon, 1/2 tsp ground ginger. Make a well in the centre, crack in 2 eggs and add 1 tsp melted honey. Add approximately 1 cup milk – more or less, depending on how thick you want the batter – I like mine to be the consistency of runny cream. Whisk the batter until smooth.Turn the oven on at a low heat to keep pancakes warm as they finish cooking. Heat a heavy frying pan and add a knob of butter, swirl it round to coat the pan. Pour in a ladleful of batter and swirl the pan round to spread the batter to desired size. Cook until the top of the pancake is uniformly covered in little dimples then flip over and cook second side to golden. Lift out into an oven-proof dish and keep warm in oven till serving. Continue with the rest of the batter. 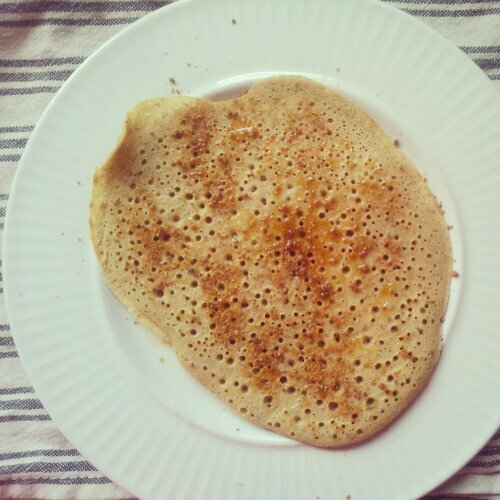 I like these buckwheat pancakes served with a generous squeeze of lemon juice and a sprinkling of coconut sugar, rolled up just so. That pancake looks like it is halfway towards being a crumpet. Awesome!